Bsc (Hons) Pod Med, M.Ch.S. HPC Reg. Jennifer has been practising Podiatry since 2005 after qualifying at the Durham School of Podiatric Medicine. She has NHS experience working with the ‘At Risk’ diabetic and rheumatoid patient due to her time spent employed by Sunderland Royal Hospital. Podiatrists / Chiropodists can be thought of as a type of ‘Foot Doctor’. They are able to give advice on how to look after your feet and what type of shoes to wear. An initial consultation with Jennifer lasts approximately 45 mins andis usually completely painless, even pleasant! Even if your feet are generally in good condition, a single session of podiatry to tidy up nails, remove hard skin and give general foot care advise is highly recommended. 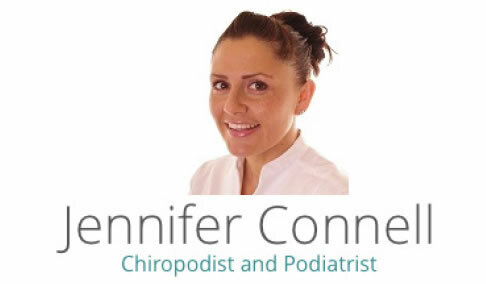 Jennifer Connell is a fully insured member of the Society of Chiropodists and Podiatrists and is also registered with the Health Professions Council holding a certificate for the use of Local Anaesthetic. Full treatment: £35 for 45 minutes. Short treatment: £20 for 15 minutes. Please note payment is by cash or cheque only. I have had a continuous problem with the big toe for a couple of years. It was initially thought that it was a fungal infection. However the problem was quickly resolved by Jen. Her expertise is without question exceptional, furthermore she is very kind and considerate. Nothing is too much trouble. She has removed the toenail, I can not rate her treatment highly enough. Thank you Jen. The luxury of having Jenny look after my feet was the reason I first went to her. We always had a great laugh and I looked forward to our sessions. When I suffered a serious accident, she still looked after me – in hospital and later at home. When she moved to the Wellness Centre, I naturally followed her. I can rely on her to deal with post-accident issues and we still have a great laugh while she is looking after my feet. The facilities and location of Chester Wellness Centre complement Jenny’s skills perfectly. I can’t recommend her highly enough.